I wrote about skin lighteners for the What I See Project. For an industry that changes with the seasons, some adjustments take a little longer to bed down. We’ve now completed the Fashion Weeks for New York, London and Paris. Before it all began, the Diversity Coalition, a campaign for greater diversity on the runway launched last year and spearheaded by veteran model booker Bethann Hardison, and supported by former supermodels Iman and Naomi Campbell, published its statistics on the use of black models in 2013’s runway shows. In London in 2013, JW Anderson and Preen made the biggest improvements, using four black models each in 2013 compared to one before then. Temperley London used two black models, whereas before they had none, whereas Moschino Cheap and Chic had no black models at all, no change from previous years. 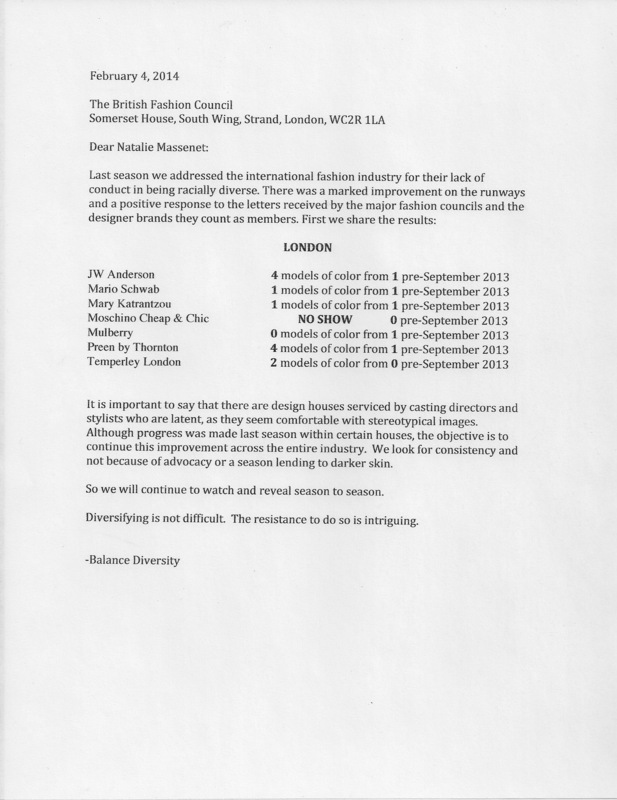 The numbers for this year aren’t in yet, but the Sunday Times reported that black models were still struggling to get cast in fashion shows despite the British Fashion Council writing to fashion houses urging them to diversify their shows to reflect the diversity of London. Or just, you know, real life. I agree that it’s ridiculous to have all-white fashion shows in London, but surely it’s ridiculous anywhere. The world is diverse and fashion is a global business. This may be high fashion, but these images influence high street fashion and powerfully shape what we consider to be beautiful. This is true for body image as well as skin colour – and the excuses that are often given for rejecting black models are “aesthetic”: one casting agent told the Sunday Times that designers would often say that black models were “too extreme” and “their features don’t fit”. It does feel like we’re having a “Black” moment in the media and entertainment industries. The convergence of the Bafta Awards and London Fashion Week this year underscored this, with Lupita Nyong’o the undisputed red carpet darling, celebrated for her acting talent in 12 Years a Slave, as well as for her distinctive, gorgeous fashion sense. She stands out for many reasons; not least because she represents an image of black womanhood that’s not often celebrated –a dark-skinned woman with natural hair. She also joins five other Black actors on the cover of Vanity Fair’s Hollywood issue, widely touted as their most diverse yet in a year when Black actors are storming the awards ceremonies. But is this a season or are we turning a corner? Time will tell if these actors continue to get offered Oscar-worthy roles, in particular roles that aren’t limited by history or biography to only be played by Black actors. Hopefully, in time we won’t need to keep tabs on the number of Black models on the catwalk or actors on the red carpet. We need more diverse stories and storytellers to reflect the world we live in. What Shonda says about the gatekeepers of media holds true for fashion too. A year on from the launch of the campaign, race is firmly on the agenda and black models are not afraid to speak up. Heavyweights like Iman and Naomi Campbell have broken the silence and impressively, younger models still at the stage of building their careers have joined in; Jourdan Dunn has been particularly outspoken. 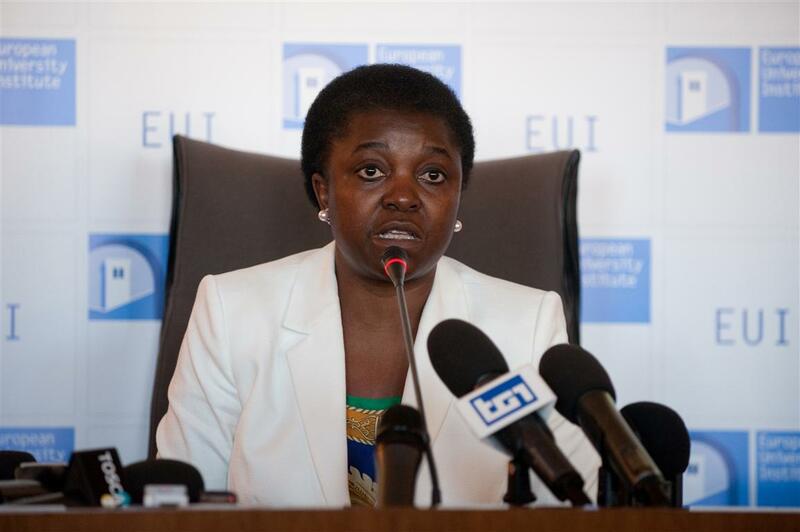 I wrote a profile of Italian politician Cecile Kyenge for Black Feminists’ Inspirational Women Series – click to read it on the Black Feminists Website. A poll I saw a month or so ago showed that international students no longer feel welcome in the UK – at a time when Universities need their money more than ever. Among other things, students ought to be taken out of the net migration target. The Lib Dems might adopt this policy at their Spring Conference, but (and I know this is cynical, forgive me) I’m sure they’ll drop it in a heartbeat depending on which way the wind blows in (the next?) coalition. The part that amuses me most about the article is the “now”. NOW?! When it comes to racism, it seems there are two levels: skinheads and thuggery or uncomfortable jokes. I do think the jokes are off-colour and racist. But they’re not the worst thing. In fact, these fairly obvious things are often focused on because it helps us to overlook structural issues and insidious racism. The sort of racism that lets you know that you’re not welcome, that you don’t fit in – and it doesn’t need to leave a burning cross on your lawn, scrawl on your wall or tell stupid jokes in your face to do it. It’s more slippery and more socially acceptable. It makes the “common sense” argument with coded language and appeals to people’s discomfort with change. It has a soft focus gilded image of a past that never was. And that past certainly didn’t include you. Along the way, this racism will try to chip away at your rights as a rant against “political correctness” and squeal about marginalistaion while ignoring the fact that it has the luxury of doing so frequently and loudly as it speaks from a place of power and in the majority. It wants to stop the world so that it can get off, because now life is more complicated with all these different people (and women and gays) wanting to speak up and be heard. I am also not alone in being bothered for quite some time by UKIP’s sexism, homophobia… and racism. And that’s the real link to the Edinburgh incident with Farage. The Scottish reacted to many things I’m sure, but also to Farage’s narrow, stunted little-England schtick which basically excluded everyone outside the Southern heartlands. He seeks to project that peculiar take on Englishness as a vision for Britain and a definition of Britishness. The trouble is, that excludes pretty much everyone, not just people of colour. It’s a vision that doesn’t touch the diversity of Britain – not just its racial diversity, but the diverse tribes and nations of this island. Yes, Dan, UKIP is racist. And has been for some time.Welcome to the party.